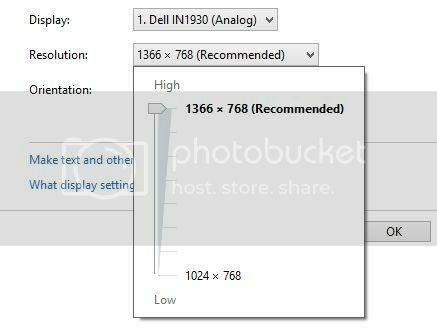 I want to change the screen resolution of windows 8 release preview as I want to make my screen large to display the characters bigger to prevent the damage of my eyes as I am using spectacles from last 5years and it’s not good for my eyes. Is view sonic touch screen monitors are compatible with windows 8 release preview? Re: How can I change the resolution of the screen of windows 8 release preview? 5. Click on the save option. STEP 1: Go To Control Panel > All Control Panel Items. STEP 2: Go to Display. STEP 3: In "Display" Select "Adjust Resolution" in the Left Pane. STEP 4: In the Change of Appearance of your Display, Click on the Dropdown Box "Resolution" and Select which you are interested in by moving the bar from top to bottom or vice versa. STEP 5: Click on "Apply". Prompt Box arrives asking you " Do you want to Keep these Changes". Click on the "Keep Changes". You are done with it. It’s quite similar to what we do top change the screen resolution in window7. In window 8 From the Metro Start screens you need to enter into the main desktop, you can do this by pressing your keyboard Start button or by Clicking on the Desktop title. Once you’re on the desktop right-click on the wallpaper and click Screen resolution. 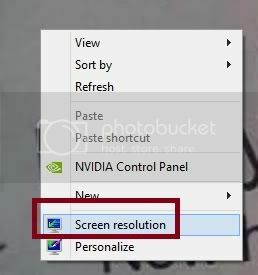 Changing the screen resolution in Windows 8 is basically the same as Windows 7. That being said, I had a few minutes tonight so I figured I’d run ya through the process groovyPost style. * From the Metro Start screen you need to enter into the main desktop, you can do this by pressing your keyboard Start button or by Clicking on the Desktop tile. * Once you’re on the desktop right-click on the wallpaper and click Screen resolution. * Then click OK, and you’re done! 5. ﻿Click Keep to use the new resolution, or click Revert to go back to the previous resolution. Hiii dear...In windows 8 realease preview, changing the screen resolution is more easier than in windows 7. Just press the window key and then you will be taken into the new metro user interface.In the metro interface you will see a tile named Desktop is present. Click on the Desktop tile to go to the old windows 7 like desktop.Just right click on the blank desktop area and you will see screen resolution option in the popup menu. Change your resolution according to your need. 1.from the metro start menu enter into the main desktop. 2.you can do this by pressing your keyboard start button or clicking desktop on the titile . 3.on your desktop right click and select the option screen resolution.